I have to be honest when I say, I'm not a massive lover of beauty boxes. When I first started blogging I signed up for Glossybox and although I thought it was a genius idea getting a surprise box delivered to my door every month, I was often left disappointed by the contents. I'm not disrespecting Glossybox in any way as I did enjoy receiving the boxes, I'm just giving my honest opinion when I say I don't believe they were value for money and for that reason, I cancelled my subscribtion. With this being said, I've never looked into other beauty box subscriptions as I didn't want to risk signing up and being left disappointed again. 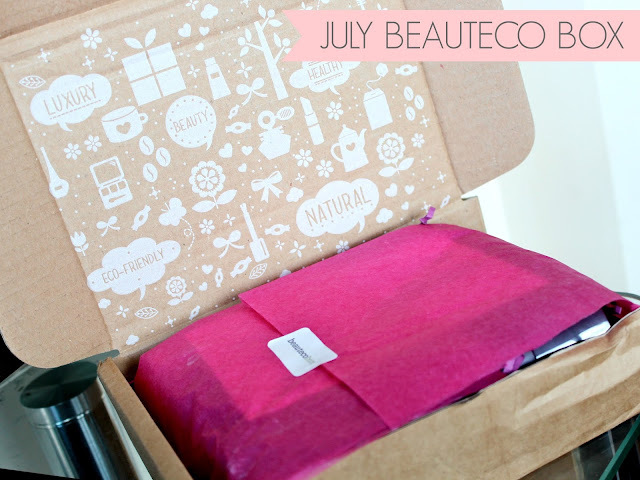 However, when I was contacted by Beautecobox a little while ago and asked if I'd like to try their July box*, I couldn't say no. After reading about the concept behind their box and seeing the products up for grabs, it was an offer too good to miss out on. Unlike other beauty boxes, Beauteco offer their subscribers a 'menu' each month that gives them the option of not one, not two but three different boxes. Each box contains a different mixture of products so you can choose the one that suits your tastes and needs best which is a really thoughtful touch. To top it off, the box the products arrive in is 100% recyclable and the products inside contain ingredients that are safely biodegradable too. Yay for an eco-friendly beauty box! I decided to go for menu two from the July options and the contents are very impressive as four out of the five products I received are full size. The four full size products include Neal & Wolf Elevate Volumising Lotion (RRP £11.95), Neal & Wolf Harmony Intensive Care Treatment (RRP £12.95), Art Deco Shadow Base (RRP £8) and Art Deco Soft Kajal Liner (RRP £6.75). Add all of that plus the 10ml sample of Pukka Radiance Serum (RRP £6.40) and this box is worth a whopping £46.05, more than three times the £10 plus £2.95 p&p this box retails for. I haven't actually tried any of the products I received yet other than the eyeliner which is fabulous but I plan on doing individual reviews when I've had chance to try them all thoroughly. I will say one thing though - the Neal & Wolfe hair products smell incredible and as a lover of hair care, I'm so excited to try them out. I love the deep purple and cream packaging and the bottles are humongous! I'm also intrigued by the eyeshadow primer as it isn't a product I ever think of using so it will be interesting to see if it does make my eyeshadow last that little bit longer. The Pukka serum sounds fabulous too - anything with the term 'radiance' in the name will more than likely get a huge thumbs up from me. Who doesn't love injecting their skin with a healthy glow? Considering beautecobox was only launched in May, I'm very impressed with their ethos, their service and the concept behind this box. If I could choose to subscribe to any beauty box right now, this one would be at the top of my list. You can find out more about it here if you're interested in subscribing and getting your hands on the July box. Keep an eye out for my full reviews on the products I received too - I can't wait to try them! What do you think of the beautecobox? Is it one you'd be tempted to try? I like the concept of this box and also the thing that some of the products come in full size, and also is eco-friendly. I would love to see the reviews on this products specially in the hair ones. This sounds like great value! It's great how you are able to choose from 3 too! I've been wondering whether to try out a beauty box and this seems impressive regarding the amount of full size products you have received. Definitley worth a look I think. Can't wait to read your reviews on the products. There's so many beauty boxes out there now i can't keep up with them all! This looks like it has some really good products in it though, really interested in the eyeshadow base! I get a Glossybox every month and I LOVE it! I have tried other beauty boxes but Glossybox for me wins! I wrote a blogpost about my July Glossybox! You should check it out! It looks like a great beauty box and I would like to try it! Getting a choice over which products you receive is a great idea. Unfortunately, I already have far too many products in my beauty cupboards to justify signing up to a subscription service, but if I ever manage to work through my stash, I'd be very tempted! I have been using the Artdeco Eyeshadow Base for more than a year now and I absolutely love it. You cant get anything better for the price. 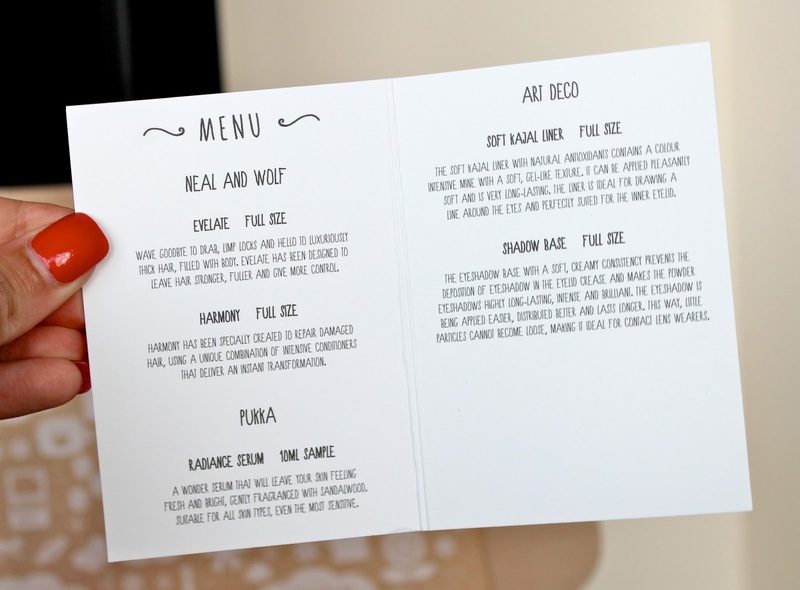 Love that it has a little menu, so cute. I feel the same about beauty boxes though..maybe after seeing this though I may make the splurge. 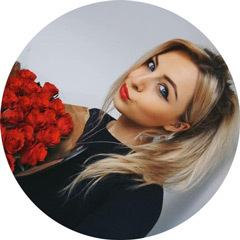 I'm currently subscribed to Glossybox and I often purchase the Latest In Beauty Boxes as they have more beauty products in there that I'm going to use. I'm considering cancelling my Glossybox as I've been left disappointed when receiving my monthly box too. I have always wanted to sign up to a glossy box, but was unsure. But after reading your post, I subscribed after a little more research. I have wanted to order a beauty box for ages but was unsure what to subscribe to, I agree I don't think Glossyboxes are worth the money sometimes! I have to admit, this may take the place of my monthly subscription to Glossy..
Ooh, I like the look/sound of this. I'm with Glossybox at the moment and it's so hit and miss. I've had some boxes where I don't like a single product and then others where I love them all! I like how you can eliminate that disappointment element with this by choosing from the menus- so clever! I'm going to do a little bit more research into this and have a serious think about signing up.